This design has many elements, but it´s mainly related to surfing. Jonathan requested a 3/4 sleeve tattoo which could include a small surfing figure and the main values in his life. We chose to place a tiki on the surfboard because it is a protection symbol, and to symbolize the almost religious union reached with the waves, culminating into the sun as a symbol of eternity and positiveness, with a manta on the inside to represent the freedom felt on the sea. The honu shell motif symbolizes the voyager, and the turtle represents his family, with the fins being the headletters of four dear persons. 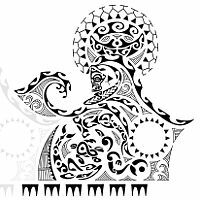 The dolphin, hammerhead shark and fern surrounding it indicate joy, determination and responsibility; the manaia is the guardian angel protecting it.